The common cherries which can be found in your country might be totally different with the Russian cherries. The difference and unique thing of cherry in Russia are about the size, colour and the taste. Talking about the size, they have quite large size than usual cherries, while the color tends to be brighter red and the taste is very fresh, very juicy and sweet, so it is not like the sour cherries we usually eat. The varieties of sweet cherry can be found a lot in Crimea Region, they are : T-shirt, Francis, Cara cares, Drogana yellow and Napoleon. The best time to find ripen cherry is around mid-June. At that time, you can find fresh cherries with cheaper price and you can make sure that it is from local Russian products and not imported. Also it is better for you to buy it directly to the babushkas which sell their fruits fresh from the tree. Besides you can help the local income, you can experience sweet fresh berries right from the garden, where you can find only in Russia. Mulberry, as one of berries family, belong to the Russian popular berries along with strawberry, cranberry, lingberry and raspberry. It is not surprising since the generations preserve the fruits well in their garden. The thing you should remember that Russian mulberry are quite different with the other mulberry in terms of taste and colour. The taste is so unique and distinct from one and other varieties, in detail there are three types of mulberry based from colour differentiation; red, black and white. The sweetest one is white mulberry, while black has a slightly sour taste. It is important to know the best time of mulberry ripen season, since it only last for about a month (usually start from mid-June until mid-July). Go find fresh it in Crimea city where Mulberry can be easily found on the streets for the limited time only and feel the unique taste of Mulberry right of the tree. The name might seem unfamiliar, but this fruit belong to pear family. The distinct feature which makes it unique from other fruit is the rich fragrant that can be smelled from a far distance. Aside from the outer appearance of fruit , quince has almost similar shape with common pear, the difference are in forms of bigger size and brighter yellow in color. The peak season of quince to start ripen is in September and October. This time you can find it scattered everywhere in the cities, both in street or in the market. Once you pass through the seller, you must be tempted by the delicious smell of fresh quince. It is better to fresh consumed or can be cooked into a jam. There are varieties of figs you can find only in Russia, they are purple figs and white figs. The thing to differentiate is unique taste, as for the sweeter and tastier, white figs is the best types, while the other is fairly not too sweet. The right season to buy and taste the fresh and fairly sweet of figs is around late June to mid-July and from early August to mid-September. The length of harvesting time is twice a year, so make sure to save the date. And come to the local fruit seller all over the cities. Remember to eat it straight, because the fig can’t last longer in the storage. Grenades –another name for Garnet – in Russia, especially in Crimea can grow in parks and gardens freely. It usually come to the peak season of harvesting in the end of October. The fruit taste is sweet, but you should pay much attention when choosing it. Because for some garnet, the aouter appearance looks delicious but when you open it, the taste would be the opposite. I will give you tips, first look at the color, the best taste has a rich red colour without any scratches. Then pay attention to the crown because fresh ripe pomegranate usually has little dry skin without green shoots. The most suitable place for growing garnet (Pomegranate) in Russia is Crimea, the reason is that this region has the pretty sunny climate than any other cities in all over the country or even in the world. So, it is not surprising if Garnet belong to fruits you can find only in Russia. This fruits is definitely one of a kind fruit you can only find in Russia. 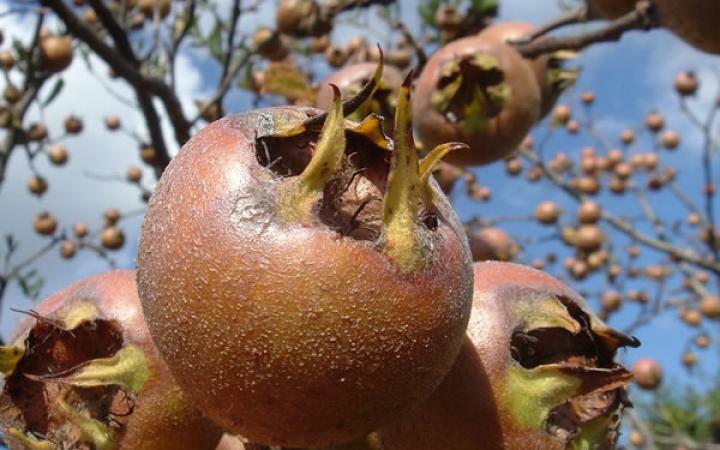 Having unique taste and shape, medlar can be found in the remote rural area of the country. It is originally a decorative plant which produces a rather small fruits contains a lot of advantages for body health. Fruit shape of medlar is most resembled to apple but with smaller size, while the flesh is almost similar to plum. And the taste is rather like sweet blueberries –very juicy with little acid sense-, full of vitamin C. The best way to consume medlar beside eat it directly is to make it into jam, jelly, juice or pickled medlar. Best time to hunt ripen medlar is in May until June. Do not ever miss it.